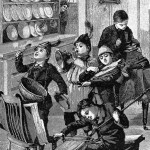 A collection of music images including instrument drawings and musicians. 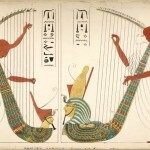 All of the musical images in this collection are in the public domain which means you could make your own music with them to add just the right note to your next creative project. Great vintage instrument illustration. 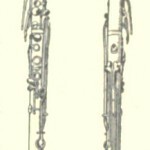 Basset horn drawing from 1910. Public domain just about everywhere too. Two different views showing all of the keys. 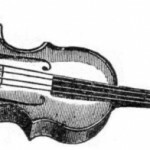 Vintage, black and white violin drawing from an 1887 advertisement. 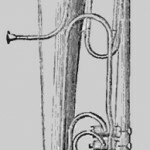 Early tuba drawing from 1844. The tuba had only been invented several years before and it is no wonder this tuba looks so different from the ones used today. Two sisters dance a charming minuet to the accompaniment of their sister on the piano. They have an audience of dollies to applaud their efforts. 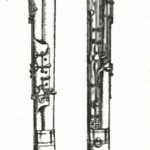 Historical drawing of a pair of harpers found by James Bruce. 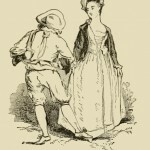 Vintage drawing of a couple dancing. 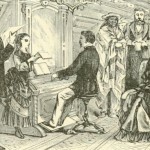 Vintage drawing depicting the entertainment on a Pullman train. 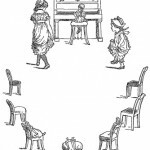 A group of children, a music book and a bit of imagination. Drawing of a vintage instrument. 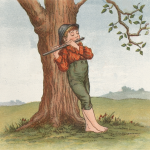 Drawing of a young boy playing the harmonica for an audience.